Worried about an ADB-savvy thief stealing the precious data off your stolen phone or tablet? 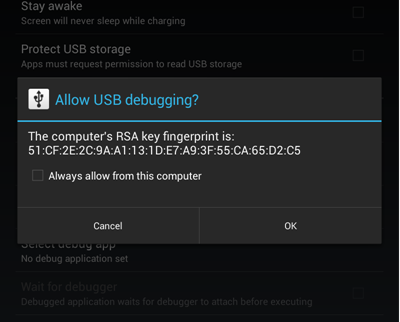 Well, Android 4.2.2 makes doing that a little harder now, with the addition of a USB debugging whitelist feature into the OS. The way it works is pretty simple - when you connect your PC to your Android device via USB, Android gets your PC's RSA key (an identifier token). 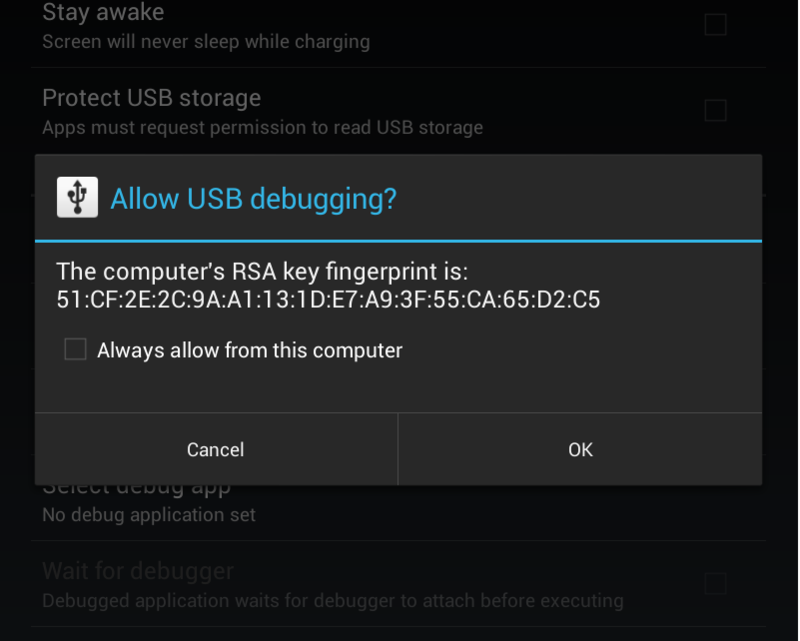 In Android 4.2.2, when you have USB debugging enabled, this now causes a prompt to appear on connection, seen below. The prompt asks you to confirm that you wish to allow USB debugging from the connecting PC, and allows you to add it to a whitelist such that the prompt won't ask you to confirm for that computer again. So, if a thief steals your phone (assuming you have a password / gesture / face unlock set), they won't be able to get all fancy with ADB and start dumping your personal data onto a hard drive. And that's good. Here's the message a potential thief would get from ADB upon attempting to list a connected device from an unauthorized PC ('offline'), and the message after that PC has been authorized ('device'). The security aspect of this feature relies on a few prerequisites, though, otherwise it kind of loses its usefulness. First, you obviously need some kind of barrier to entry to the phone: if the thief gets the prompt, that doesn't do you much good. So, your lockscreen needs a password, gesture, or face unlock set up, so the prompt won't appear. That's easy enough, and something many people already do. The next part may not exactly appeal to you, the Android-tinkering enthusiast. If your phone is rooted, has an unlocked bootloader, or is running custom firmware (eg, a custom recovery like ClockworkMod Recovery), there's a good chance you've created a potential workaround for this USB debug whitelist, and that a determined data thief could still find a way to your precious information. We won't go into specifics, but suffice to say, if your bootloader isn't locked, the USB debug whitelist can effectively be nullified.